When I was in second grade, I told a girl there was no Santa. She cried. And I liked it. Many Jewish kids I heard from were permitted to watch the Grinch every year, yet somehow nobody (including my parents) is able to explain why this is so. 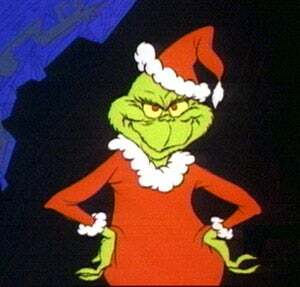 Nearly everyone who wrote to me explained that the Boris Karloff version of the Grinch was "a classic." OK. But dig a little deeper and what surfaces is a universal (and discomfiting) sense that the Grinch is a fundamentally Jewish show because the Grinch himself is a fundamentally Jewish character. I got one e-mail that concluded, "Who is more of a Grinch than a grumpy old Jew?" And a Jew with a heart problem no less? A fair point, perhaps, but why do Jewish parents want to be pushing this peculiarly self-loathing vision of the bitter old Jewish man on their kids? Do we drag our kids to see The Merchant of Venice? If anything, the weird Grinch-as-old-Jew notion would seem to suggest that of all things Jewish kids should not be watching at Christmastime, the Seussian classic tops the list. But perhaps my colleague Emily Bazelon is right, and Jewish kids like the Grinch because "Without the ending, the movie is the ultimate fantasy for a Jewish kid with a case of Santa/tree/carols envy—Christmas, canceled." Oh yes. I understand Christmas envy all too well. However, I can't remember whether or not my parents let me watch Christmas specials. I think they didn't overtly encourage or discourage it, but maybe I just blocked it out from deep soul pain! The other Jewzebel, Sadie, says "We DID watch the old 1930s Christmas Carol on New Year's Eve, but not really the kids' classics.Frosty and Rudolph plots both upset me, anyway. I just have the vague impression of Rudolph being ostracized and Frosty melting." So to all you non-Christian, American TV lovers we ask: Rudolph, yay or nay?